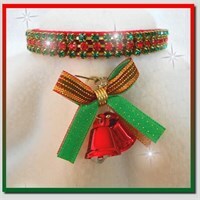 "This red nylon collar is 3/8"" wide and has a red velvet ribbon sewn onto it. It comes with the bells charm. (charm may vary). Festive!"